Today marks the second day the Monthly’s annual fundraising drive. Thanks so much to everyone who has already contributed yesterday. For those who haven’t, your tax-deductible donation can make a big difference. 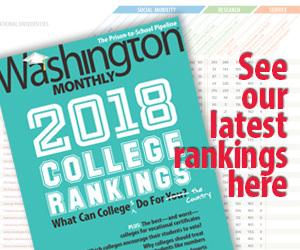 If you’re a regular reader of this site and the print magazine, you know that the Washington Monthly offers the kind of cutting-edge reporting and analysis the country needs, breaking big stories well ahead of major outlets. Also, this year, the publishers are adding a nice incentive. I have, incidentally, read Peters’ book. It’s part of the American Presidents Series, biographies of almost all the presidents written in short volumes by major American writers. I didn’t think there was much more one could say about Lyndon Johnson but Peters made use of previously untapped primary sources and several compelling associates of the 36th president. It was very interesting book to read. I very much recommend it. Print and online ads only cover part of the magazine’s overall expenses; we depend on contributions from readers to keep publishing the Monthly. I hope we can count on your support. Click here to help. You can donate online, through PayPal, or through the mail.